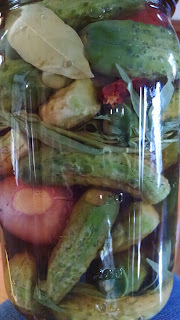 This morning, I made Sweet Gherkins using the recipe on page 306 of Preserving Summer's Bounty. It called for honey, which might just be the first time I've ever canned anything with honey in it. Basically, after soaking the little cucumbers overnight in ice water, I cooked them in a mixture of cider vinegar, turmeric, pickling spices, cinnamon and celery seeds. To this mixture, 2 cups of honey are added. That's a lot of honey. I used up the local honey I'd bought for the bees and then added in some more *gasp* store-bought organic honey. The recipe says it makes 10-11 pints, but I only got 4 and a half, so I don't know what's going on there. Then, after the other cucumbers had sat in salt for a day, they were ready to become cornichons. This recipe comes from page 90 of The Joy of Pickling. These cornichons are pickled but not canned. 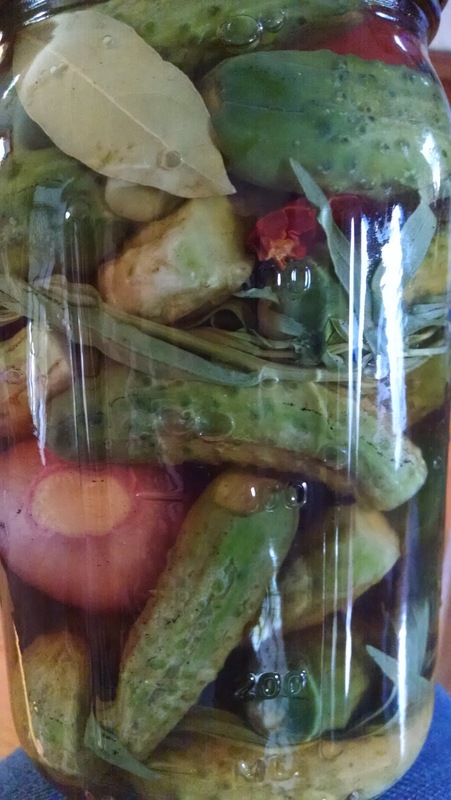 After rinsing and drying the cucumbers, they are packed into a quart jar with 4 shallots, 2 dried chilies, 1 bay leaf, 10 peppercorns, and 2 sprigs of fresh tarragon. Then the jar is filled with white wine vinegar. I finished my bottle of white wine vinegar so had to top off the jar with some tarragon vinegar instead. Now it sits on the shelf for a month before eating them. With paté. Not sure how I'll be doing pickles this year. But looks like I will have plenty out of the garden.